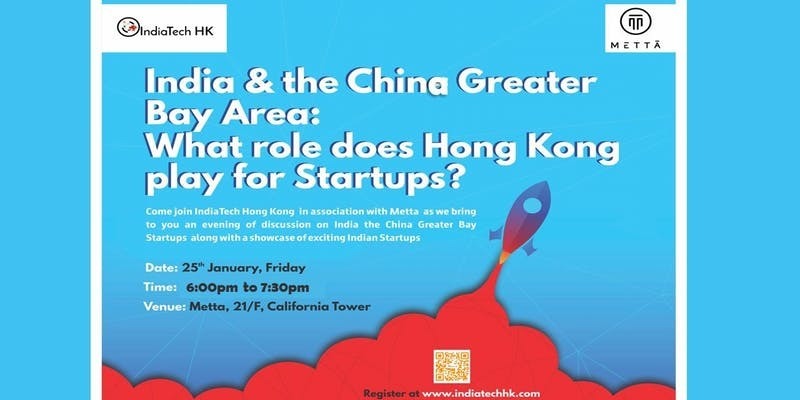 The IndiaTech HK is a community initiative to serve as a platform for information and engaging of Indian startups, both in Hong Kong and in India. We aim to increase awareness of the Indian Startup ecosystem in Greater China among those who have an interest in Indian tech scene, including the Indian diaspora in the region, and want to take part as entrepreneurs or investors. We bring this event to you in association with Metta and supported by Whub during the StartmeupHK Festival . 6: 45pm: Panel Discussion on "India & the China Greater Bay Area: What Role does Hong Kong play for Startups": Panelists will discuss about how Hong Kong plays a role in the increasing interaction between India & the China Greater Bay, and the discuss about the investment landscape for Indian startups in the greater bay. The Panel will be followed with Networking. There has been keen interest from parties in the Hong Kong Startup ecosystem to collaborate and come together to build this community. This includes prominent entrepreneur hubs, startup incubators, startup communities and individuals who are active in the startup ecosystem in Hong Kong. This would be one of many events to engage the community and build awareness of Indian Startup ecosystem. Secondly, this would be a good platform to act as a bridge between India and Hong Kong, and as an extension with China.